The Indian Motorcycle Club's newsletter is published four times a year. To receive your very own copy of Service Shots, break open your piggy bank and join today. New Club patch available. Six colours as shown - 8 cm round. Impress the women of the village with this special members only club patch. $15 delivered to your door. Get in touch and we can send one out. 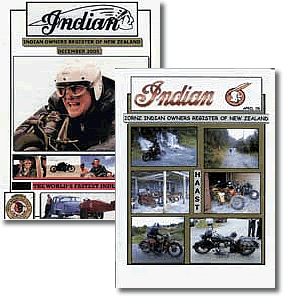 The Indian Owners Register of New Zealand started out in 1985 when a group of Indian enthusiasts, headed by Dave Blackwell of Hawkes Bay, decided to form the basis of a club with regular newsletters and yearly rallies. The club gained momentum and new members joined from throughout the country, as well as enthusiasts from as far away as Sweden, the UK, Australia and USA. IORNZ now has around 160 members and growing, mostly from throughout New Zealand, and has the elected positions of President, Membership & Subs, Editor & Treasurer. Dave Blackwell is the IORNZ Club Historian. We have a popular annual rally, alternates between the North and South Islands, which is organised by club members in the host region. Members also get the club magazine "Service Shots" four times a year. Annual subs are $30; a club patch and badges ($10 each, 6cm long, 1.4cm high) are available to members.